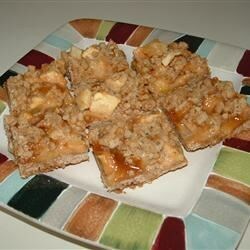 Caramel and apples make for delicious bars. Pecans in place of the walnuts would work equally as well. Preheat oven to 350 degrees F. Grease a 15 x 10 x 1 inch pan. In a small pan over low heat, melt the butter or margarine. In large bowl, combine 2 cups flour, 2 cups quick cooking oats, brown sugar, baking soda, and melted butter or margarine. Mix until crumbly. Press half of mixture (about 2-1/2 cups) in the greased pan. Set aside the rest. Bake for 8 minutes. In a small pan over medium heat, combine caramel topping and 1/2 cup flour. Bring to a boil, stirring constantly. Still stirring constantly, boil for 2 or 3 minutes until slightly thickened. Spread apples and nuts onto the baked crust. Pour hot caramel mixture evenly over apples and nuts. Sprinkle reserved crumbly mixture evenly over the top. Return pan to oven. Bake 20-25 minutes or until golden brown. Cool completely in pan. Cut into bars. (Refrigeration makes cutting easier). Store tightly covered.